The 109SS is a rugged, accurate probe that measures soil or water temperature from -40° to +70°C. The 109SS consists of a thermistor encased in a sheath made from grade 316L stainless steel. The rugged stainless-steel sheath protects the thermistor, allowing you to bury or submerge the 109SS in harsh, corrosive environments. This probe also has a fast time response, and it can be easily interfaced with our dataloggers. 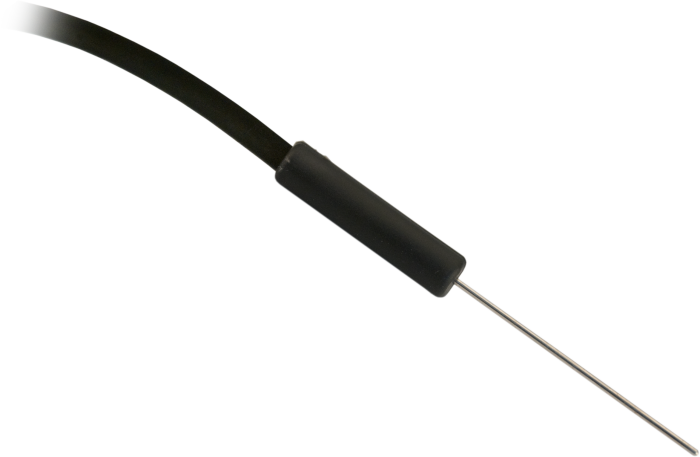 The 109SS thermistor can survive temperatures up to 100°C, but the overmolded joint and cable should not be exposed to temperatures hotter than +70°C. The sensor can be submerged to 46 m (150 ft) or 63 psi. Please note that the 109SS is not weighted. Therefore, the installer should either add a weighting system or secure the sensor to a fixed, submerged object, such as a piling. The 109SS is suitable for shallow burial only. Placement of the sensor’s cable inside a rugged conduit may be advisable for long cable runs—especially in locations subject to digging, mowing, traffic, use of power tools, or lightning strikes. The instruction set for our CR200(X)-series, CR800-series, CR1000, and CR3000 dataloggers contains the Therm109 instruction for measuring the 109SS probe. Programming is more complicated for other data loggers because they must use generic measurement instructions. If a sensor does not have an –L or other –LX designation after the main model number, the sensor has a set cable length. The cable length is listed at the end of the Description field on the product’s Ordering tab. For example, the 034B-ET model has a description of “Met One Wind Set for ET Station, 67 inch Cable.” Products with a set cable length terminate, as a default, with pigtails. Note: The availability of cable termination options varies by sensor. For example, sensors may have none, two, or several options to choose from. If a desired option is not listed for a specific sensor, contact an application engineer at Campbell Scientific for assistance.